My love for the mountain is unstoppably growing fast. Just 2 weeks after my first climb at Mt. Daguldol, I received another climb invite. This time it was just a dayhike and a lot easier than my first climb. Mt. 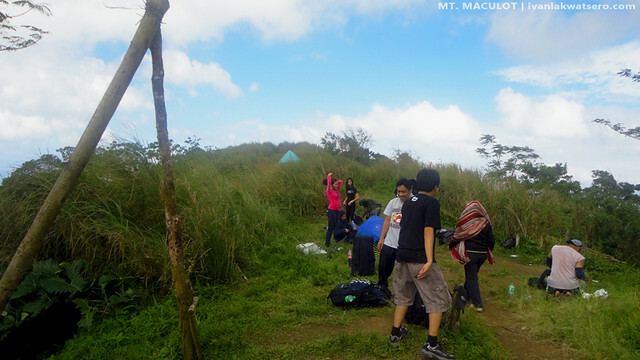 Maculot in Cuenca, Batangas became Batang Lakwatsero's second mountain. Our call time at KFC LRT-Buendia was 5:30am, I arrived at 6am (30mins late and the last to arrive, nakakahiya). We boarded a bus bound for Lemery, Batangas as it will pass by our destination, Cuenca, Batangas. The fare was only P147 and it's just roughly a 3 hour ride. The bus dropped us in front of the Arch of the Town of Cuenca where tricycles are already waiting for prospective Maculot hikers. Christine asked the driver to drop us at the Rockies jump-off (one of the two main jump-offs). The tricycle brought us first to the registration area (we registered and paid P10) before we headed to the Rockies jump-off. Around 9:20 am, we reached Ate Thelma's eatery/shower station, we drained our bladders there before we started walking the trail to the Rockies. One of us, ate Jules, went to Maculot for a marathon training so she went off about 15 minutes ahead of us. By 9:30 am, we started the trek. The trail is entirely uphill, but it's way much easier and shorter than my first trail in Mt. Daguldol. 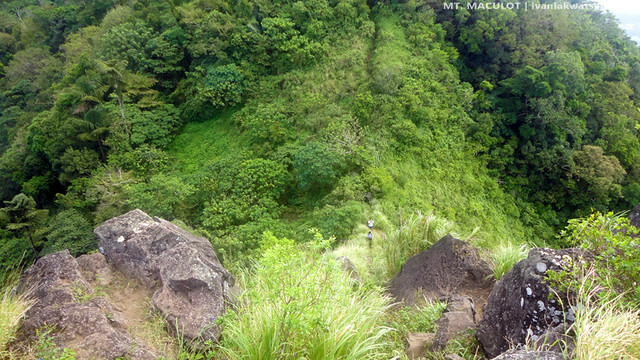 There's no forking trail at Maculot (Rockies) so getting lost on the trail is highly unlikely to happen. 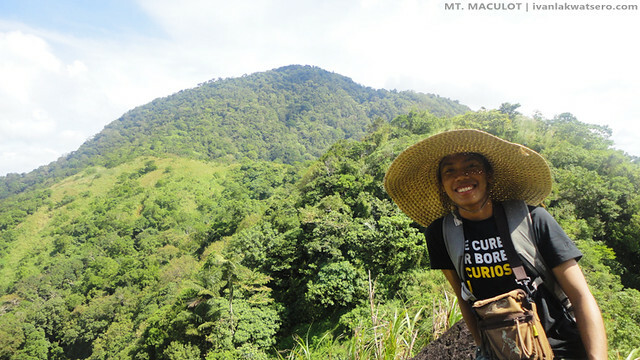 About 3/4 of the trail, I was surprised when came across ate Jules who was now descending back to the mountain's foot, she told me that I'm nearing the camp site. I walked for about 10 minutes more, and vwalla, I reached the camp site (I arrived at 10:35 am, an hour and 5 minutes climb). I bought a bottle of ice cold softdrink (P35) as a reward for myself while I wait for Christine and her cousin to reach the campsite. andaming campers nung umakyat kami at nag-triple pa ang dami nila bago kami bumaba. 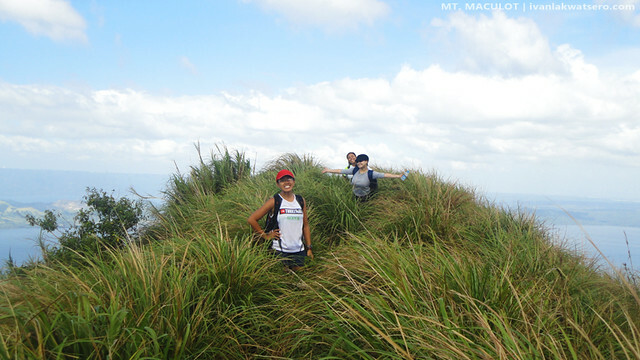 Three minutes before 11 am, Christine and ate Len arrived (congrats to ate Len for her first mountain). Ate Len quickly brought out her snacks, lots of it. To my amazement, around 11:15 am, ate Jules reached the campsite for the second time (just wow, she did Maculot twice in 2 hours, ibang klaseng training ito). Ate Jules led us to the Rockies upon her arrival (grabe, mga 5 mins lang ata nagpahinga, go na ulit siya). From the camp site, we trekked again for about 10 minutes into the Rockies. 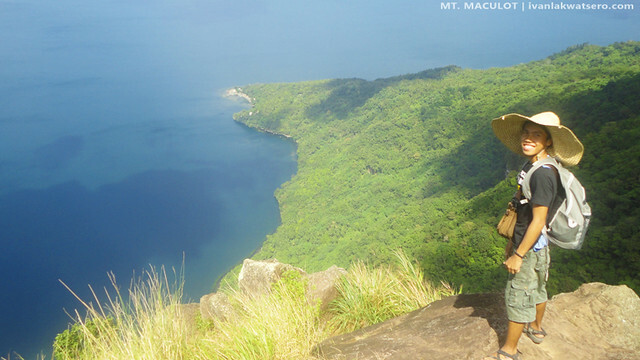 the next time I'll climb Maculot, it will be on that summit. 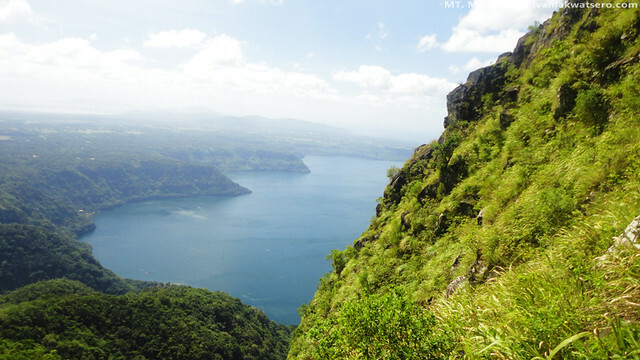 A magnificent full view of the Taal Lake was seen on top of the Rockies. 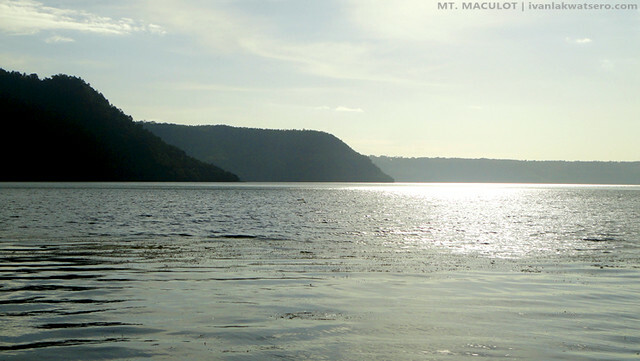 There's also, of course, the Taal Volcano, view of Mt. 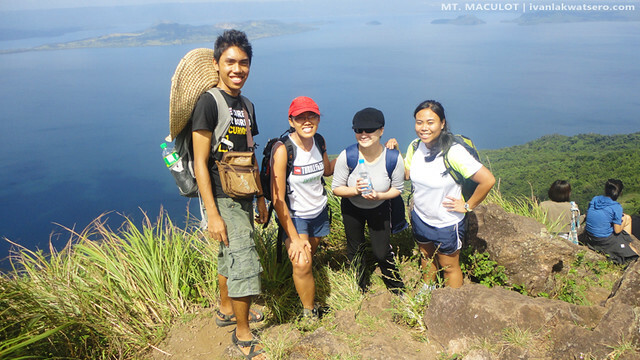 Makiling, Tagaytay and Manila Bay. At first I thought we're already done with the Rockies, but I was wrong. 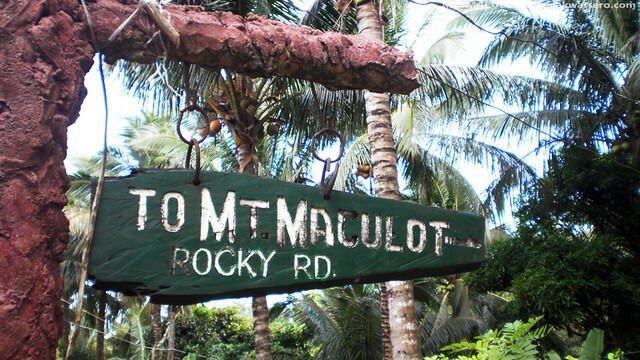 We still went down to the so called "dila ng Maculot" (according to Dermin). 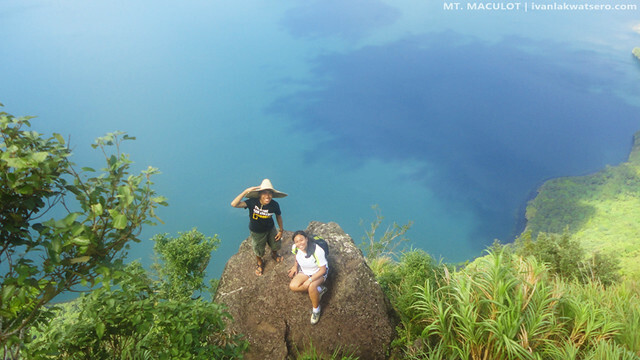 me and Christine at the "dila ng Maculot"
The view is overwhelmingly fantastic, and the breeze was awesome too. But after some 20 minutes, another group arrived, so we just bid goodbye to the Rockies and the awesome view. 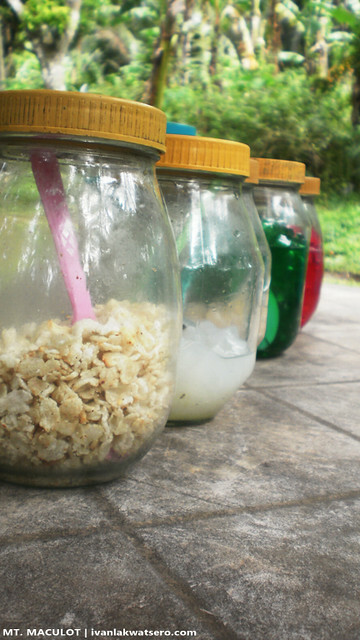 Touch down, by 1:30 PM, we're back to Ate Thelma's eatery to get our Halo-Halo reward (P30). 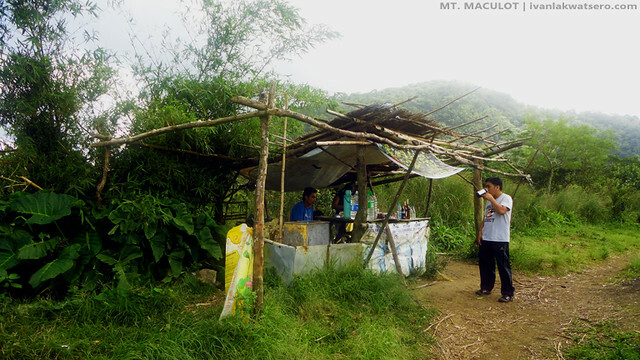 We ate lunch first before proceeding to our side trip Taal Lake via Sitio Lumampaw. By 3:00 PM, we started the looooong walk to Lumampaw. 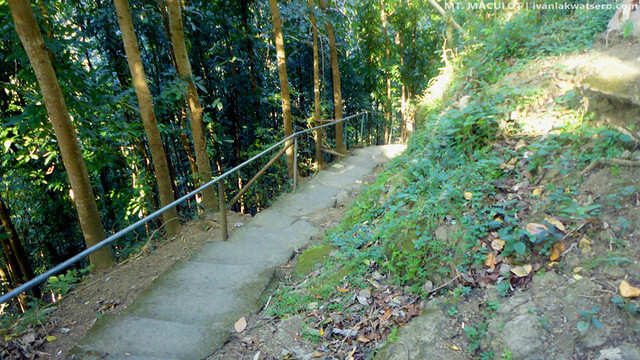 From the Rockies Jump-off, we walked 5 mins along a concrete road, then down to a thousand steps Lumampaw. It was a test of endurance, I really felt pain in my gastroc and thigh part. 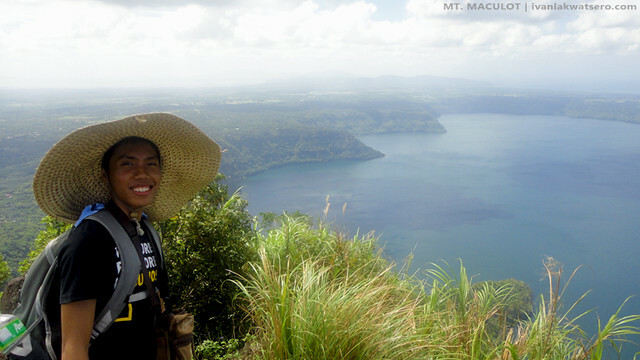 But when we finally reached Lumampaw and saw Taal Lake up close (for the first time), I simply forgot all the pain and exhaustion. 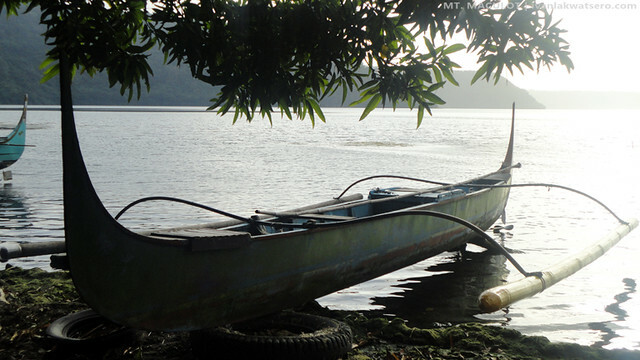 We stayed on a shed beside the basketball court to relax and feel the elements of Taal. 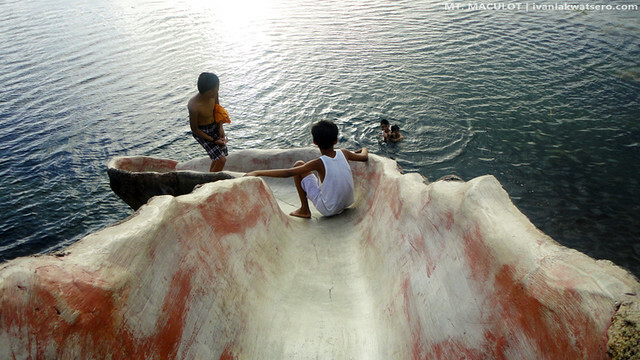 There were kids bathing, boats docked on the shore, and birds flying around. A great way to relax and be with nature for some time. We climbed back to the road after 45 minutes of resting, up again on the energy draining steps. This time I decided to count the steps as I go up and my count is..... 1,099. We then rode a tricycle back to the main road where we hopped into a jeep bound for Lipa City. Waaaa. Nakakainggit yung view talaga! Wow what a great adventure you got there. You even counted the Lumampaw steps. Why do you think it's one step short to 2,000? Anyways, I like your photos here. I'd like to subscribe by email so that I don't miss all your upcoming post. But I couldn't find any button or link for email subscription. Can you advice? Thanks. There is a fee to climb Mt. Maculot? Does the fee cover overnight camping at the top? WOW! great images. thanks for sharing. love the pic dila ng maculot! nice congratulations at nakapamundok ka narin. ako hindi pa hahaha. Ivan, madaming horror stories daw jan... nakwentuhan sana kita kung nagising lang ako ng maaga..
@Chino, at least maakyat mo na ang pundaquit sa sabado. @dermin, sayang naman, antaas pa naman ng energy ko sa mga ganyang kwento.. gudlak sa Maktrav mo..
@Len, thank you po. see you ulit sa next climb. 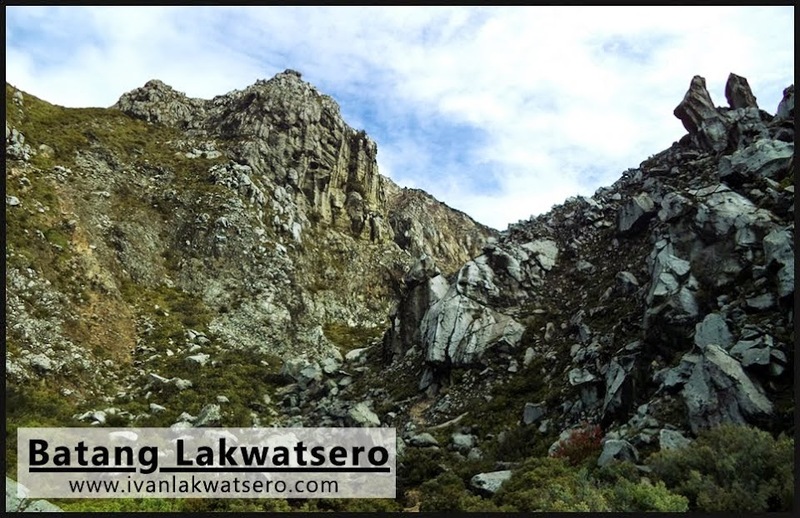 linggo-lingo ko nakikita yang mountain na yan whenever i go to batangas pero di ko pa rin yan naaakyat. the 6th pic is just awesome! na-miss ko to, i remember, we went there when i was in college, we spent an overnight there, tapos wala kaming tent, sako lang dala namin, biglang bumuhos ang ulan..hahaha! tapos bumaba rin kami dun sa brgy, geronimo tat yun, yung maraming hagdaan, 1500++ steps ata yun..kakapagod, naligo kami sa lake kaso pag-akyat namin pawisan rin..haha! 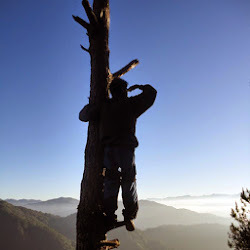 Mountaineer ka na talaga anak! Ang ganda ng view. 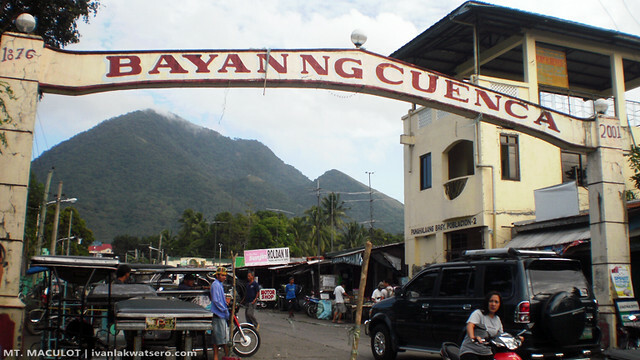 Parang gusto ko na din tuloy umakyat ng bundok. Hahaha. hello ano ba mga dapat dalhin pag aakyat? at ano ba mga dapat isuot? were going to mt. maculot on monday.. so please help me. Wow! Ok ito, may sidetrip sa Lumampaw! 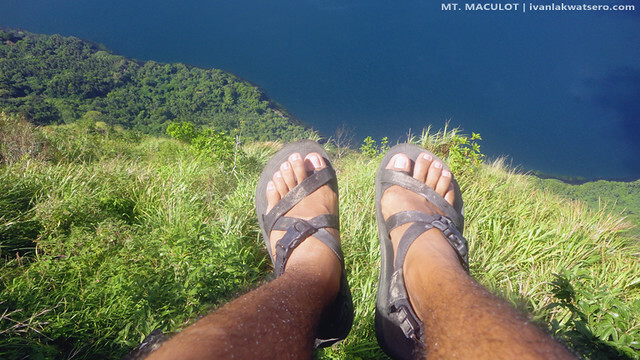 I will definitely include Lumampaw in my itinerary; will do a Maculot traverse at pupuntahan namin itong sitio! I assume walang entrance fee sa Sitio Lumampaw 'no? tama ka dyan. walang bayad sa Sitio Lumampaw. At gaano pala katagal yung looooooooooooong walk to Lumampaw? More than an hour? medyo nakakapagod nga lang yung walk sa thousand step stairs.. depende sa inyo kung gano ka-bilis yung pacing nyo. 20 minutes ko yun binaba..
Yehey! Thanks. So we'll allot 20-40 minutes siguro. Madali ba naming mahahanap yung start ng trail nito? Sabihin lang namin sa locals or brgy officials na sa Sitio Lumampaw kami pupunta? lakad lang kayo along the road mula dun sa street sign na may nakalagay na "to Mt. 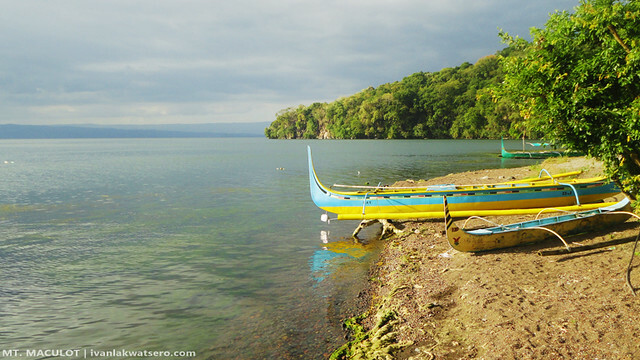 Maculot" (yung nasa 2nd photo).. deretso hangang makarating sa dulo, mula doon meron nang hagdanan na mahaba..
nothing really special, para lang tlga malapitan mo yung taal lake at kung gusto mo magtampisaw..
Last question na ito (hopefully, haha) : Accessible kaya ito from the other jump-off (Grotto)? 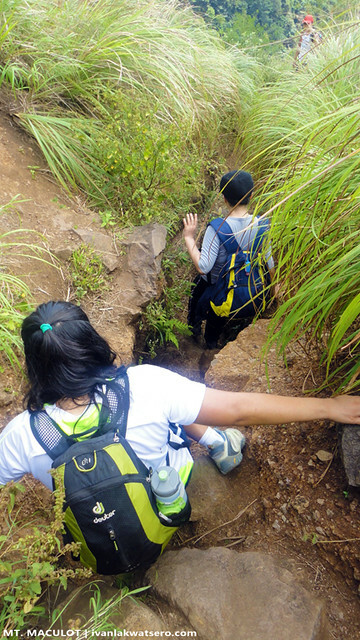 Kasi kung sakaling totoong sarado pa ang grotto bilang entry point, gagawin na lang namin siyang exit point (na allowed naman daw) ng aming traverse hike. nung bata pa kami sabi sa amin ng matatanda eh maligo daw araw-araw kasi pag nagka-kuto kami eh ililipad kami ng mga yun sa Makulot. Mukhang hindi naman totoo. Lapit lang namin dyan pero hindi pa ako nakaakyat dyan. oo nga. sayang yun. hehe. Hi po, can you teach me how to go there. i'm from manila.